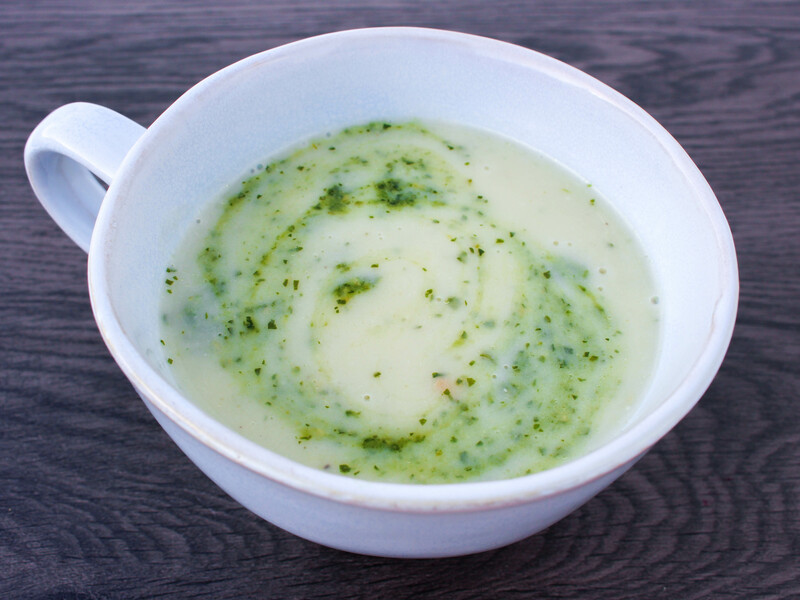 Take your cauliflower soup to another level with this recipe. A spoonful of Watercress Pesto gives this dish a flash of colour with its vibrant green hue and the peppery flavour of the watercress adds a nice kick. Watercress is particularly high in vitamin K and calcium which can help prevent osteoporosis, another great reason add this leafy vegetable to your diet. Remove the outer leaves of the cauliflower then chop into fairly small chunks. Place in a large bowl and rinse thoroughly with cold water, drain then set aside. In a large pan heat some olive oil then add chopped leek, celery, thyme and a whole clove of garlic. Gently cook until the leek starts to soften then add the drained cauliflower. Add a good pinch of salt then cook the cauliflower gently for about 10-15 minutes. Cooking the cauliflower gently and slowly in this way will enhance the flavour of the soup. Stir frequently to avoid it catching on the bottom of the pan. Add enough water to cover the vegetables then peel and chop the potato and add that to the soup as well as the stock cubes, a cup of milk, a pinch of nutmeg and some pepper (I used white pepper but you can use any you have to hand). Turn the heat up to a boil then lower the heat to gently simmer the soup for about 30 minutes or until the cauliflower and potato have softened. Blitz with a stick blender, check the seasoning, then serve with watercress pesto.